Be the first to share your favorite memory, photo or story of Furl. This memorial page is dedicated for family, friends and future generations to celebrate the life of their loved one. Furl Lee Ascue, age 96, long-time resident of Tonkawa, Oklahoma, passed away September 6, 2017 in Tonkawa, at Willow Haven Nursing Home. A graveside ceremony with Navy Honors will be held at 10 am on September 14, 2017, at the Tonkawa IOOF Cemetery with Chaplain Tom Howard officiating. Arrangements are under the direction of Trout Funeral Home & Cremation Service of Tonkawa. 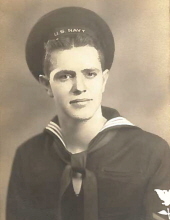 Furl was born on February 10, 1921 to Frederick Lee Ascue and Ethel Tyson Ascue in Cherokee, OK. After high school, he joined the US Navy, serving for 20 years. While in the Navy, Furl became an aircraft engine mechanic and upon his retirement from the Navy, he continued working as a aircraft engine mechanic as an employee for Lockheed Martin. Survivors include his daughter Vivian Dreon of San Jose, CA, son Stephen G Ascue of Sunnyvale,CA, sister in law Normalea Ascue of Tonkawa, niece Linda Williams and husband David of Tonkawa, nephew, Chris Ascue and Steve Ascue and great-nephew Ty Williams and wife Natalie of Tonkawa, grandchildren, Daniel Dreon and Matthew Dreon and 5 great-grandchildren, Alana Dreon, Braydon Dreon Jaxson Dreon, Gianna Dreon and Chase Dreon, all of California. Furl was preceded in death by his wife Nettie Ascue, parents, son Robert Dean Ascue, brothers Dwayne and Merle Ascue. Memorial Contributions may be made to the Willow Haven Nursing Home, in Tonkawa. To send flowers or a remembrance gift to the family of Furl Lee Ascue, please visit our Tribute Store. "Email Address" would like to share the life celebration of Furl Lee Ascue. Click on the "link" to go to share a favorite memory or leave a condolence message for the family.